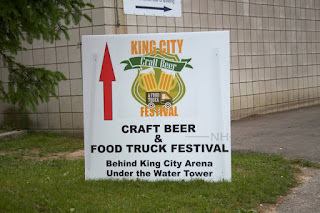 Home / Events / Random Places / King City Craft Beer & Food Truck Festival! June 13th! Be there! King City Craft Beer & Food Truck Festival! June 13th! Be there! Craft beer and food trucks, 2 of my favourite things come together in King City for a day of fun and music. It's an all ages event(even dogs are allowed!) boasting entertainment, such as Jaugernaut, Blackboard Blues and Dear Rouge. I'm so excited! I took a look at their Facebook page and this is an event you don't want to miss. When you see this many photos of people cooking, eating and having a great time, it makes you need to be there. Just coming for the tunes? Cover is $5! Coming to enjoy the whole event? 19+ tickets are $10 online and $15 at the door! The Lion's Combo Pass(19+ only) gets you entry AND an entry into the draw for some sweet prizes. You can also buy charity tickets at the event, but they are limited! Check out the festival's website for local details on designated driver services, hotels and parking. If you've never been to King City, come to the festival and enjoy!